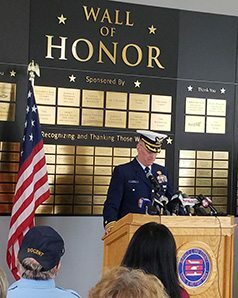 BUFFALO, N.Y. – May 11, 2017 – The Buffalo & Erie County Naval & Military Park hosted an unveiling of a new display to honor the memory and naval career of Lieutenant Commander (LCDR) Ralph C. Wilson, Jr.
Captain Brian Roche announces that Friday, May 12 – and every Friday of WNY’s Armed Forces Week thereafter – will now be known as Lieutenant Commander Ralph C. Wilson Jr. Day at the park, and will include free admission for all. LCDR Wilson, who left a gift to the Naval Park upon his passing in 2014, was a proud veteran who rose to the rank of Lieutenant Commander in the U.S. Navy and served as Commanding Officer of a World War II Minesweeper, the USS Picket, from March 1945 to January 1946. Also, a surprise announcement was made to the public and to Mrs. Mary Wilson, LCDR Wilson’s widow, that tomorrow — and the Friday of every annual Western New York Armed Forces Week thereafter — will now be known as “LCDR Ralph C. Wilson Day” at the Buffalo & Erie County Naval & Military Park. On that day, admission will be free for all visitors, to honor his legacy. To commemorate the occasion, Buffalo Mayor Byron Brown read a city proclamation. Proclamations were also delivered from the New York State Senate and Assembly via Senator Chris Jacobs’ office and Assemblywoman Monica Wallace’s office, respectively. Representatives from Erie County Executive Mark Poloncarz were also on hand to mark the occasion, as were members of the park’s board of directors and staff. 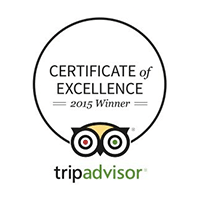 The Naval Park is open daily from 10 a.m. to 5 p.m. through the end of October. Its World War II era ships include the USS Little Rock — the only guided missile cruiser on display in the U.S. today; the USS The Sullivans, a destroyer named after five brothers who died when their ship sank during the Battle of the Solomon Islands; and the USS Croaker, a Gato-class submarine. A variety of military vehicles and aircraft are also on display, in addition to a museum building filled with artifacts, interactive exhibits and historical information spanning virtually all of our nation’s wars and military conflicts. 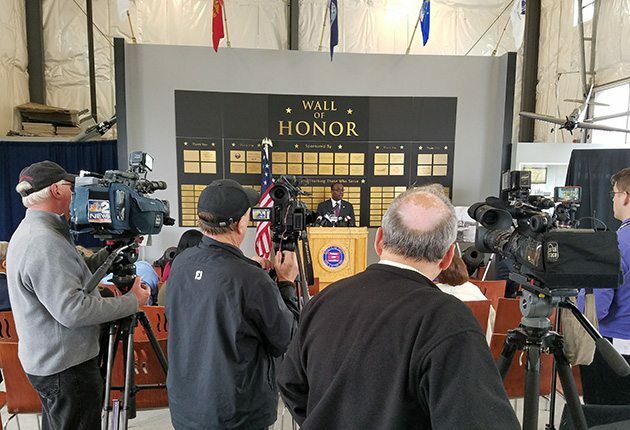 Buffalo Mayor Byron Brown reads a proclamation announcing that Friday, May 12 would be Lieutenant Commander Ralph C. Wilson Jr. Day in the City of Buffalo. 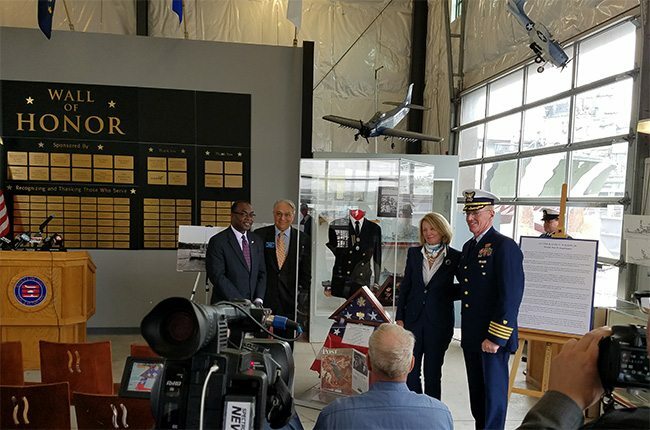 From left, Buffalo Mayor Byron Brown, Naval Park Board Chairman Don Alessi, Mary Wilson, and Naval Park Executive Director Brian Roche unveil the new display dedicated to Lieutenant Commander Ralph C. Wilson, Jr.